The Edelstam Foundation had the pleasure to meet with Dr. Kofi Annan, former Secretary General of the United Nations, together with Dr. Jan Eliasson, Deputy Secretary General of the UN, during a seminar at Uppsala University when they discussed the role of the United Nations, based on their own experiences and the challenges today. The seminar was moderated by the Senior Professor, Dr. Peter Wallensteen, from Uppsala University and Dr. Hans Corell, former Under-Secretary-General for Legal Affairs and the Legal Counsel of the United Nations and board member of the Edelstam Foundation, gave concluding remarks. 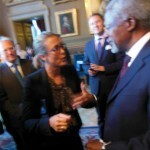 Ms. Caroline Edelstam, Vice President of the Harald Edelstam Foundation talks of civic courage with Dr. Kofi Annan, former Secretary General of the UN and Nobel Peace Prize Laureate. 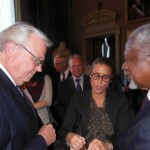 The Vice President of the Edelstam Foundation together with Mr. Kofi Annan. Under the supervision of Dr. Hans Corell, Board Member of the Edelstam Foundation and former Under-Secretary-General for Legal Affairs and the Legal Counsel of the United Nations, Ms. Caroline Edelstam ties a bracelet on Mr. Annan’s wrist, a symbol of civic courage. 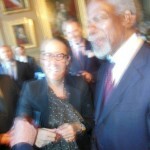 Mr. Kofi Annan is very happy to receive three wishes. 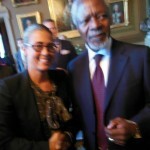 Mrs. Caroline Edelstam, Vice President of the Harald Edelstam Foundation, is very honored to meet with Mr. Kofi Annan. 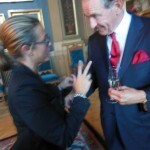 Ms. Caroline Edelstam meets with Mr. Jan Eliasson, Deputy Secretary-General of the United Nations. 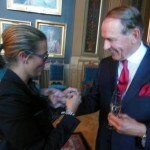 Mr. Jan Eliasson is very proud to wear a symbol of civic courage – The Edelstam Prize Bracelet. 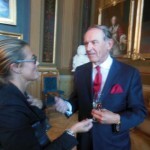 Mr. Jan Eliasson talks of Ambassador Harald Edelstam’s courageous actions that contributed to save more than thousands lives in Norway during the Second World War and in Chile 1973.